Wandering into the darkened main gallery of Gertrude Contemporary on the first afternoon of the Experimental Congress, the visitor was greeted by two prominently placed video loops selected by the curators of Melbourne’s Screen Space. 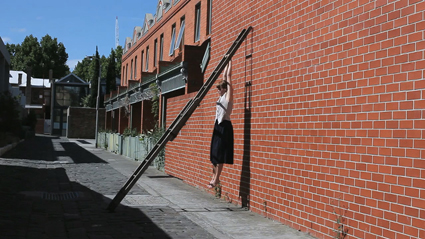 In Jacqui Shelton’s Silt/Suspended Load (2013), Shelton is filmed from a fixed camera angle as she dangles from a ladder, swinging gently back and forth. In Walk III (2010) the camera tracks alongside maker Anna Fuata as she strolls past weatherboard bungalows in what appear to be Melbourne’s northern suburbs: the uncanny quality of the piece stems from the fact that it consists of reverse-motion footage of Fuata walking backwards, though it takes a while for the penny to drop. Each work functioned as a geometric cityscape as well as a document of a performance: viewed full-length from an unchanging distance, the artist-stars resembled video-game protagonists, focused on nothing beyond an immediate, seemingly pointless task. At the outset of a three-day event examining the past, present and potential future of Australian experimental film and video, it seemed worth pondering the allegorical implications. Were we permanently suspended, trapped in an endless cycle? What could it mean to move backwards and forward at once? Convened by Danni Zuvela and Joel Stern of the (originally) Brisbane-based OtherFilm group, the Congress was itself conceived along an avowedly circular premise, as an exploration of “the concept of collectivity:” in other words, bringing people together to discuss what the point of bringing them together could be. Evening screenings and presentations were preceded each afternoon by informal roundtable discussions, open to the public but attended mainly by curators and artists at the rate of about a dozen per day. Historical background was supplied by group elders Dirk de Bruyn and Richard Tuohy, spinning tales from those far-off days of the mid-to-late-1990s, when the Melbourne Super-8 Film Group flourished at the Erwin Rado theatre in Fitzroy and Sunday night screenings of avant-garde classics were held at Cafe Bohemio just around the corner. Truth be told, I can remember some of this stuff myself, strange as it seems to have lived through an era when experimental moviemakers could function without significant commercial ambition in an analog world, rather than as entrepreneurial digitally-savvy ‘creatives.’ The Super-8 Group recurred as a reference point throughout the Congress, with De Bruyn devoting half a presentation to the best lines salvaged from their newsletter (“Be suspicious of men with cameras and record collections instead of girlfriends,” from the late Vikki Riley, remains the money quote). It would be unwise to go too far in romanticising the group, given the hit-and-miss offerings at any given open screening, not to mention a management style which (by all accounts) was exactly what you’d expect from an organisation run on a shoestring by cranky artists. Yet it did provide a space where hobbyists, purists, go-getters and try-hards of all stripes could rub shoulders and exchange ideas. This was a milieu where even narrative filmmakers such as Bill Mousoulis and Mark La Rosa were able to stay in touch with an experimental culture; likewise, it’s uncertain if Tony Woods’ sophisticated mingling of documentary and abstract modes would have found an equally receptive audience elsewhere. Nowadays such pluralism feels all but unimaginable, except perhaps online. The somewhat passive-aggressive opening statement of the Congress took up this theme, citing Freud’s notion of the “narcissism of minor differences” in relation to organisations competing for slices of the funding pie. Now that most so-called film is entirely digital, the question of medium specificity is moot—though a few diehards such as Tuohy and his associates at the Artist Film Workshop cling to the old avant-garde traditions, like monks still toiling at illuminated manuscripts in the age of printing. In the meantime, many video artists remain averse as ever to anything that smacks of cinematic craft, though most would presumably acknowledge in principle that no action can be recorded in a ‘neutral’ way. Too bad the discussions never got down to the nitty-gritty of exploring what artists fixated on the material qualities of celluloid could learn from those concerned primarily with performance and duration, and vice versa. But then, for every testament to the value of co-operation the Congress offered a reminder of the innately (and valuably) antisocial side of the avant-garde—in De Bruyn’s preoccupation with paralysis and trauma, in Tuohy’s abrasive flicker film Dot Matrix (2013) and perhaps most viscerally in the work of Andrew Harper, whose Piss (light) (2007) was the upshot of submerging a reel of Super-8 film for a year in the titular bodily fluid. This was shown in a video copy, the original being too fragile and precious to risk; Harper’s initial, unrealised plan was to project it onto a ‘screen’ consisting of his body, where the material basis of the work originated. This was another kind of closed loop, again echoing the solipsism of the Congress more generally; explicitly political issues were hardly broached, apart from some forlorn talk about Occupy-style takeovers of public space. Still, discussion did give rise to some modest, practical suggestions about how a sense of community might be maintained: through an email list, for example, or a successor to the film co-ops of the past. Another technique of circuit-breaking was suggested by reports of curatorial projects aimed at bringing experimental film and video to a wider audience, such as De Bruyn’s Outside the Outside screening series in Dandenong, or the annual shows which Jim Knox has mounted in recent years at the Meredith Music Festival. Knox’s presentation to the Congress included extracts from numerous oddities in his collection, ranging from a 1950s Disney cartoon about life on Mars to an extraordinary found-footage montage by Soviet director Elem Klimov, satirising the decadence of the West. As ever, his admirable approach is less about irony than about getting us to recognise the cockeyed artistry in work far outside any official canon—demonstrating, in passing, that history can always be written anew.